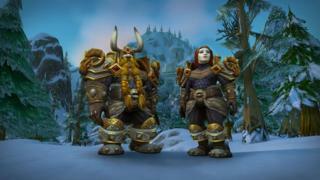 World of Warcraft allows players to dive into a vast fantasy realm populated with players from around the world. Together they battle to survive alongside dragons, trolls and warlocks - even on Christmas Day. Video games have long proved a formidable force in capturing the hearts, imaginations and wallets of people all over the world. The most immersive gaming experience, according to its fans, is World of Warcraft and in Azeroth, where the game is set, even Christmas Day is celebrated with turkey feasts, snowball fights and presents under a tree. In a time where many of us spend more time online, what does it mean to celebrate 25 December in a virtual world? "Me and my friends usually wake up quite early together. We log on, meet up and make sure everyone is in the same location," says 20-year-old Kieran Hart. "We've usually prepared things like presents and joke gifts, so everyone has a surprise on Christmas morning. We usually give each other [pets] or toys [in the game] that we don't have. "We just have fun, and celebrate like anyone would on a normal Christmas - we have a Christmas dinner, and then take part in group activities like hide-and-seek and scavenger hunts, which I love. "I play on Christmas Day because we enjoy each other's company. People that don't know each other in real life or who aren't close physically can still spend time together and make a connection in the game. "I'm in Cheltenham, some friends are in Bath, some are in London, so we can't meet up in real life. So we play World of Warcraft together. "Not everyone has a family that's close together, so you can't easily meet up on Christmas Day. A virtual world is a great place where you can compensate for that." Image caption Naomi Elcoat says the game gives her daughter a "wider Christmas experience"
"In the morning, me and my daughter will log into World of Warcraft after opening presents in real life, and go to Orgrimmar and see what presents Father Winter has left for our characters," says 33-year-old Naomi Elcoat from Bolton. "Last year was her first Christmas in the game so she got loads of new things, she was really excited. We then went to Timeless Isle because we had gotten some in-game currency for Christmas and bought some [pets]. "Doing this has made my relationship with my daughter better. In 2017, we got her the game, thinking she would get bored in a month. Boy, was I wrong. "Her dad loves that we will go in-game together, and I keep her busy while he's cooking. "It's also good because I can keep an eye on how she acts online and I can vet her friends, but also teach her about online safety. "We also don't have family nearby dropping in on Christmas Day, so spending time in-game with friends gives her a wider Christmas experience - especially seeing as a chunk of people we know [in the game] are from all over Europe. "She asks them how they celebrate and how they greet each other, then joins in with them. She's an absolute star." "My dad was an alcoholic - he divorced my mum and died when I was quite young. That made going home for Christmas a bit hard for me, so I moved out when I was 16," says 27-year-old Stefan Szalk from Wigan. "My friends [online] were there for me - messaging me on Christmas Eve, making sure I was OK and asking what my plans for Christmas Day were because they knew I was going to be alone. "When I logged in on Christmas Day, lo and behold, there were about six of my friends online and they all wished me a happy Christmas, and stayed online to make sure I was OK.
"When I was struggling, I was depressed and if I wasn't playing World of Warcraft, I'd probably have found some way to drink. "It's like a second life. You can escape from the real world and live in Azeroth. You don't need to worry about what's going on in the real world, you can just play and do whatever you want. "A lot of the things that you get from a generic Christmas, you can get from playing the game. "They always have festive characters around, you can still open a present in the morning under a tree, you see people wearing Christmas outfits everywhere. "It's such a unique experience." "Because of my break-up with my wife, I've lost a lot of my friends and obviously a lot of family," says Joseph Morriss, from Fife in Scotland. "So the way for me to spend time with the people that I love is online in the World of Warcraft. "I've had a really hard time trying to restart my life from nothing. [My friends online] helped support me, they helped get me through my tough times, and through that, the relationships I've built are completely set into stone. "On Christmas Day, I'm hoping to run some of my own events for the people I play with. We'll be doing some timed dungeon events to see who can complete them the fastest. "You can even cook a little roast turkey too, which we plan to do. "You want to spend Christmas with the people you care about - it doesn't matter whether it's with your family, your friends, or people you met online. "It makes the day a little less daunting because there just seems to be this huge expectation of spending Christmas with friends and family, but not everybody in the world has those relationships. "For me, my friends are all online and that is how I have to celebrate with them if I want to celebrate Christmas."